Amy Friedman grew up in Cleveland, Ohio and has an undergraduate degree from Barnard College, Columbia University and an MA in creative writing from City College, New York. She is an author, co-author, editor and writing teacher whose work has appeared in numerous publications, including the New York Times, Salon and the Toronto Globe and Mail. She is the author of Kick the Dog and Shoot the Cat, Nothing Sacred: A Conversation with Feminism, Tell Me a Story, The Spectacular Gift, and Desperado’s Wife: A Memoir. Amy also is the writer/producer of the award-winning audiobook series, Tell Me a Story, based on her long-running syndicated newspaper feature for Universal Press Syndicate. She has co-authored and ghosted many books, including the winner of IACP’s 2014 book award for Literary Food Writing, One Souffle at a Time: A Memoir of Food and France with Anne Willan. Amy’s work has been anthologized in a number of places, including most recently Stricken: The 5,000 Stages of Grief from Dalton Press and the Seal Press release Dancing at the Shame Prom: Sharing the Stories That Kept Us Small. 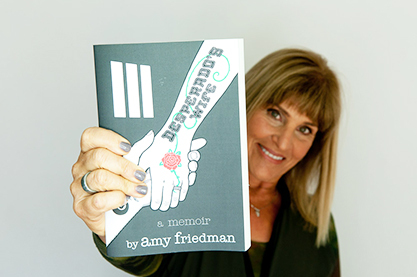 Amy has also written for the stage and screen and teaches memoir and personal essay in the UCLA Extension Writers Program, at the Skirball Cultural Arts Center in Los Angeles, and at the Idyllwild Arts Center in California. Amy lives in Los Angeles with her husband, the writer Dennis Danziger.